We have moved our Manhattan location into an adjacent building (1709 Ft. Riley Blvd, the old Taco Casa building). It is the same great food with the same great team, but in a bigger, more elegant dining atmosphere. Baan Thai in Manhattan now delivers!! Call 785 473 7201 or go to Wildcat2go.com to see our full menu and place your order! Enjoy!!! We open on Sunday, November 20, 2011, at 5 pm if a special sneak preview of the best Thai cuisine in Kansas! Come join us for this "soft launch" as we prepare for our grand opening next week. 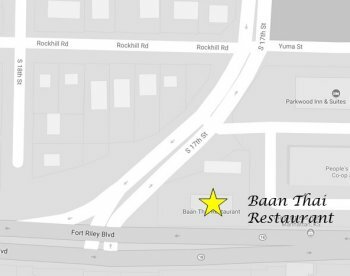 The best Thai food in the Kansas City area is now available in Manhattan, Kansas! Since November 20, 2011, we have been dedicated to bringing a unique, authentic, Thai dining experience to the people of Manhattan and the greater Flint Hills region. Dine-in or carry-out, we promise the best Thai food this side of Bangkok! Our menu is thoughtfully designed to bring customers a variety of the many tastes of Thailand. From spicy salads to rich noodle dishes, we offer a wide range of choices for any taste. We offer authentic Thai beverages, like Thai ice coffee and Thai ice tea, and special Thai deserts, like our famous sweet rice and mangoes. We even have a selection of American dishes for the kids. Please feel free to call ahead for seating or take-out orders. We also accept reservations for our catering. NOTE: Please contact us by phone before attempting to send us anything via fax. Copyright 2017 ProSIM Company, Inc.